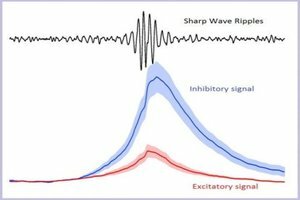 So-called sharp wave ripples (SWRs) are one of three major brain waves coming from the hippocampus. The new study, a cooperation between the research groups of Professors Peter Jonas and Jozsef Csicsvari at the Institute of Science and Technology Austria (IST Austria), found the mechanism that generates this oscillation of neuronal activity in mice. “Our results shed light on the mechanisms underlying this high-frequency network oscillation. As our experiments provide information both about the phase and the location of the underlying conductance, we were able to show that precisely timed synaptic inhibition is the current generator for sharp wave ripples.” explains author Professor Peter Jonas. The neuroscientists found that the frequency of both excitatory and inhibitory events at the synapse increased during SWRs. But quantitatively, synaptic inhibition dominated over excitation during the generation of SWRs. Furthermore, the magnitude of inhibitory events positively correlated with SWR amplitude, indicating that the inhibitory events are the driver of the oscillation. Inhibitory events were phase locked to individual cycles of ripple oscillations. Finally, the researchers showed that so-called PV+ interneurons neurons that provide inhibitory output onto other neurons are mainly responsible for generating SWRs.